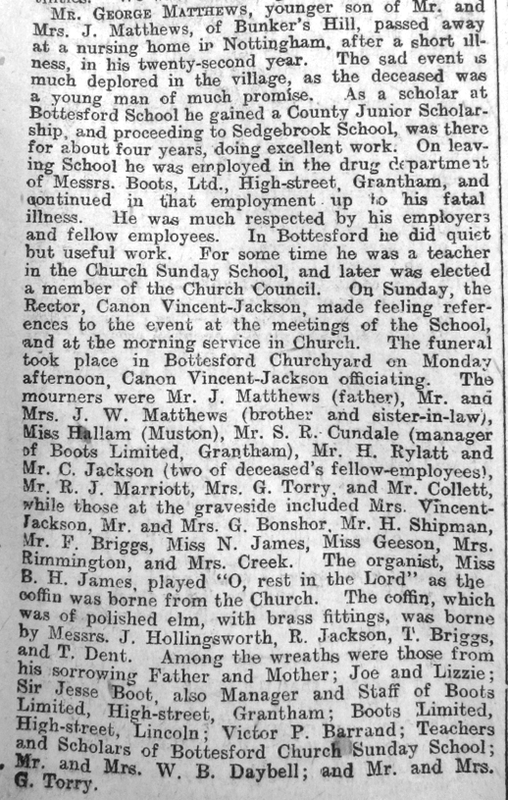 Grantham Journal 22/1/1916 - Obituary of George Matthews, Joseph Matthews younger brother. Joseph William Matthews was born in 1888 in Bradford, Yorkshire. Joe Mathews was the son of Joseph and Alice Maud Matthews. His mother was born in Otley in 1862 and his father was born in 1862 in Ranskill, Notts. His father’s work as a signalman for the Great Northern Railway brought the family to Bottesford in the late 1890s. By the 1901 census Joseph Snr. was no longer working for the GNR in Wilsden. He had moved with his family to Grantham Road, Muston and continued to work as a signalman. Joseph William was living with his parents and his brother George Thomas aged 7. In 1900 the Bottesford School Log Book records that Joseph had won a County Junior Scholarship. His marks placed him 3rd in the county. He left Bottesford School and went to Sedgebrook School. 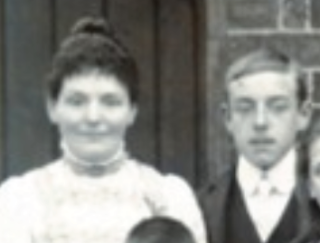 He also appears on the 1902 Muston School photograph standing next to the School Mistress. It looks as though he might have been assisting a pupil teacher as part of his education at Sedgebook Grammar School. Whether he carried on his teaching duties is unknown. In about 1904 he would take up employment as a corn merchant’s clerk with Messrs. Mee and Son of Aslockton and would work for them for thirteen years until his enlistment in early 1917. By 1911 the family were living at Bunker’s Hill, Easthorpe, Bottesford. Joseph Matthews Snr. still worked as a railway signalman. Joseph William, now in his early twenties, continued his employment as a clerk in Aslockton. His younger brother George was a pharmaceutical student. He too would gain a County Scholarship to Sedgebrook Grammar School and on completion of his pharmaceutical training work for Boots, the Chemist on the High Street in Grantham. Sadly he succumbed ‘to a fatal illness’ in early January 1916 (Gratham Journal 22/1/1916). Joseph William married (Mary Elizabeth) sometime before 1917 and lived with her on Belvoir Lane, Easthorpe. He was also a member St Mary’s Church choir. 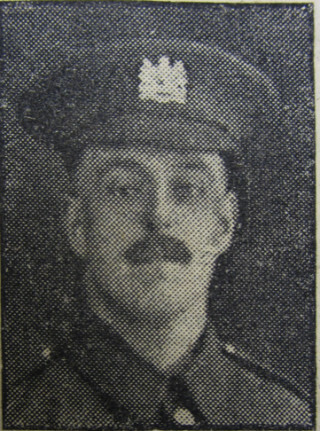 Joe Matthews enlisted at Melton Mowbray in the Leicestershire Regiment (service number 38128) and later served with the 2/8thBattalion, Worcestershire Regiment at Paschendaele. The 2/8th Battalion of the Worcestershire Regiment was formed in September 1914 as a Second Line Home Service Battalion. However, such was the shortage of manpower that another new division was formed in August 1915 – the 61st (2nd South Midland) Division and 2/8 Worcestershire Battalion formed part of the 183rd Infantry Brigade of this division. They landed in France in May 1916. 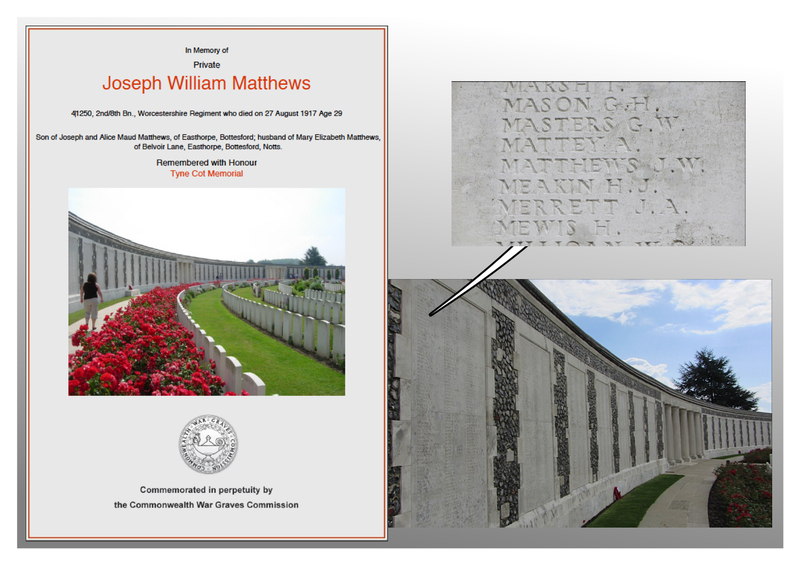 Private J. W. Mathews Missing – News has reached Bottesford this week that Private J.W. Mathews, Worcestershire Regiment, has been reported missing. 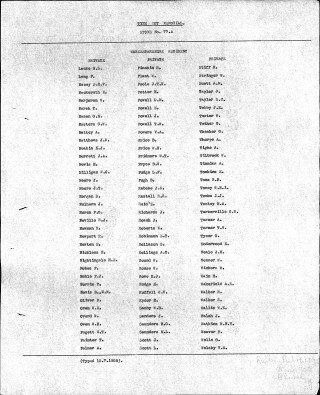 A letter to his wife at Bottesford, on Wednesday, from a member of his platoon states: – It is with deep regret I write this letter, but as Mr. Matthews was a very dear friend of mine, I feel it my duty to write you, for I am very sorry to say, that, after an engagement with the enemy, Mr. Matthews failed to return, It was August 24th (sic) when our lads went over the top. I am writing on behalf of his section, All of us miss him, for he was always one of the best. We are still clinging to one hope, and that is Mr. Matthews has been taken prisoner, I sincerely hope so, for he will be safe at least. He did his best, and was last seen quite calm. Pte. Joseph Matthews had been abroad about three months, joining up early this year. He was for about thirteen years in the service of Messrs. Mee and Son, of Aslockton. He was an old Sedgebrook School boy, and the winner of a County Scholarship, at Bottesford School. His fellow members of the Bottesford Church Choir and his many friends will sympathise with his wife and his parents in their anxiety concerning him. Sadly there would be no good news. He was reported missing presumed killed on the 27th August 1917. From the 17th August the 2/8th Battalion was continuously in and out of the front line west of Ypres in what was to become known as the Battle of Passchendaele or the 3rdBattle of Ypres. 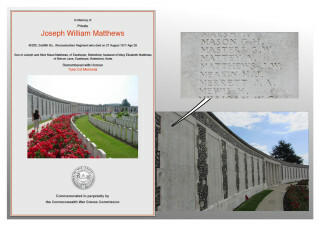 Joseph Matthews was one of 584 men in the 2/8th Battalion. Over the coming days they experienced very heavy shelling as they moved between support positions and the front line. In late August and early September the 61st Division was involved in the efforts to push the line forward at positions around Schuler Farm and Aisne Farm near Kerselaar. On the 27th August the 2/8 Worcestershires were fighting on the Steenbeek in front of Aisne Farm. ‘At Aisne Farm, the 2/8th Worcesters had attacked at the same moment (1.55pm) as the first line battalions further north; but with no greater success. The attacking platoons had lain out all morning in shell holes which the pouring rain had turned into slimy ponds. They had been unable to move from these holes as the ground was under direct observation from the enemy’s position and was swept by fire. Nevertheless, at 1.55pm the Territorials advanced with fine spirit. The little groups of fighting men struggled out of their water-logged pits and ploughed forward through the mud. So many of them slipped and fell in that wilderness of shell holes that their rifles became clogged with mud and could not be fired; but the attackers went forward with the bayonet as their only weapon. Try as they might, they could not keep up with the barrage and the fire from the German machine guns struck them in front and from flank. Before Aisne Farm could be reached the attack came to a standstill. Further to the right the two platoons of D company nearly reached Gallipoli Farm [but] by nightfall it was clear that the attack had failed and orders came to dig in.’ (p. 284 Worcestershire Regiment in the Great War Volume 1 by H. Fitzm Stacke). The Battalion War Diary gives further graphic details. On the 26th August at 8.30pm they ‘moved up to the front and relieved the 7th Worcestershires. B Company on the left A Company on right. D Company divided into two parties detailed to attack AISNE HO & TRENCH & GALLIPOLLI. C Company in reserve on old German Line. 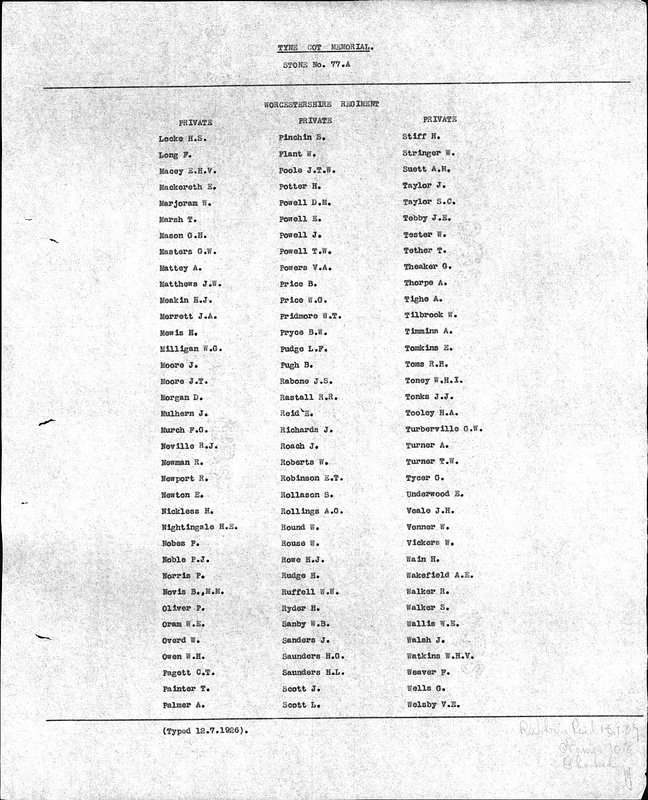 The Battalion lost one quarter of its men in one day. It is hard to imagine what it would it would take to remain ‘quite calm’ as Joe ‘did his best’. Joseph’s will left £160 11s 9d. to his wife, Mary Elizabeth Matthews. Within 18 months Joseph and Alice Matthews had lost both sons, George to illness and Joseph on active service. Joseph Matthews died in 1937 and Alice Matthews in 1940. Both are buried in the St Mary’s Church graveyard. Great story, my relative Alfred Perry also served with 2/8th Worcestershire Regiment and was killed on the same day, 27th August 1917 at Aisne Farm, shot by a sniper. I am visiting Ypres in a few weeks and using maps and accounts that Paul Roberts posted, will try to find the exact spot where the attack took place. Let me know if you’d like some photos of what it looks like now.